I know many of my friends across the country are pretty much cursing winter at this point. Ice storms in the south, snow storms back east, and constant rain and drizzle here in the lovely pacific northwest…the lack of drainage in my backyard is a win-situation for the ducks, I suppose. Instead of waddling through the grass every morning, now they swim. Literally. The ducks aren’t the only ones who “win” in the winter though – anyone who cooks, eats, devours, etc. a delicious winter-y dish is also a winner. Because some dishes are just BETTER in the wintertime. Like stew. 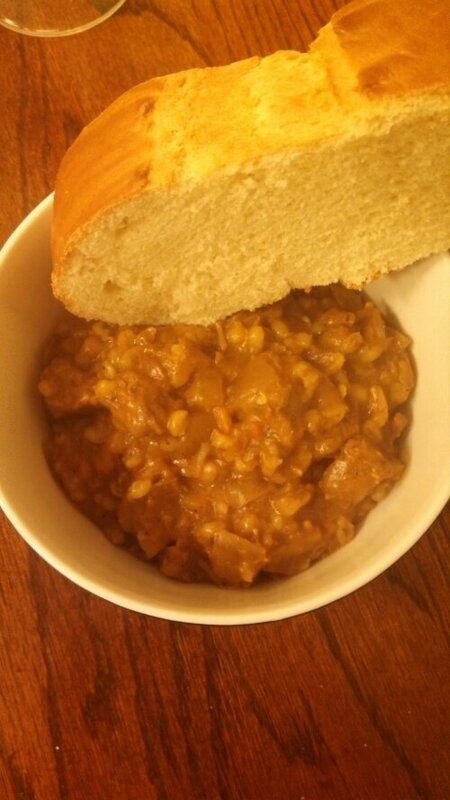 I bought beef barley a few weeks back (it’s only, like, a buck – another win), in anticipation of making this slow cooker beef barley stew by Nutmeg Nanny. I’m so glad I did. And I would make it again…and again…and again, if I could! I did do a few things differently, which might alter your final dish. My good friends made this recipe after I did, following the directions of the original blogger, and their version left something to be desired. 1. I did all of my chopping the night before (onion and carrot, but I omitted the pepper due to my husband’s lack of heat-tolerance). 2. 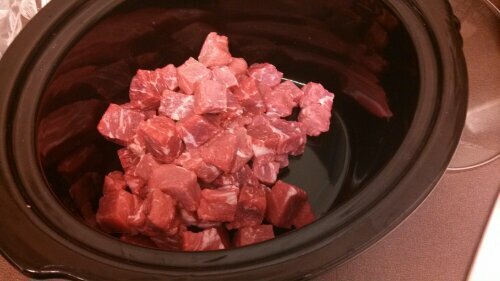 I used beef buillion cubes, as I already had them on hand. I followed the instructions on the package (boil one cup of water per one cub). I definitely recommend doing this, to make sure that it dissolves properly and that the flavours spread. My husband had to add in a 4th cup of stock mid-day, as almost all of the liquid had evaporated. 3. I omitted tomatoes cuz I’m NOT a fan. But then I remembered we had some tomato sauce in the freezer and I had my husband, who was home, defrost it and dump it in. He did this after adding a 4th cup of broth. 4. I trimmed most of the fat off the meat. I think this is helpful so you don’t get mouthfuls of…well…fat and grisel. Ew. 5. I used dried, ground thyme instead of fresh. I didn’t have a chance to pick up fresh, and the leftover would have just gone to waste. 6. Uh…I just realized that the original recipe called for 6 cups (they stated 48oz and my quick, extremely poor math led me to believe that was 3 cups), so no wonder my liquid had almost evaporated halfway through! I am not sure why my version came out so incredibly delicious and my friend’s version came out so incredibly NOT delicious, but my first thought is that I used tomato sauce, and she blended her tomatoes into liquid. I have to admit, when I made it, I was worried that it didn’t have enough flavourful spices, but I was so happy with the verdict. If you try this, I definitely recommend reading my notes above, and I believe you will love it too! Let me know any other alterations or changes you make! 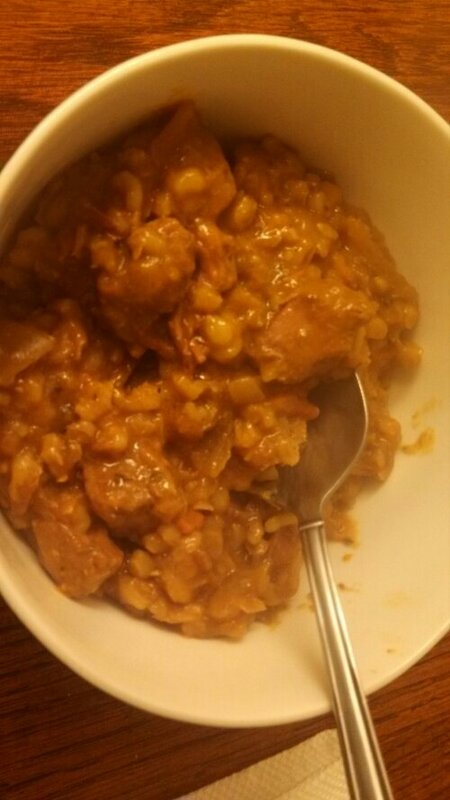 -Add all ingredients to a large 6 quart slow cooker, give a quick stir and cook on low for 8-10 hours. 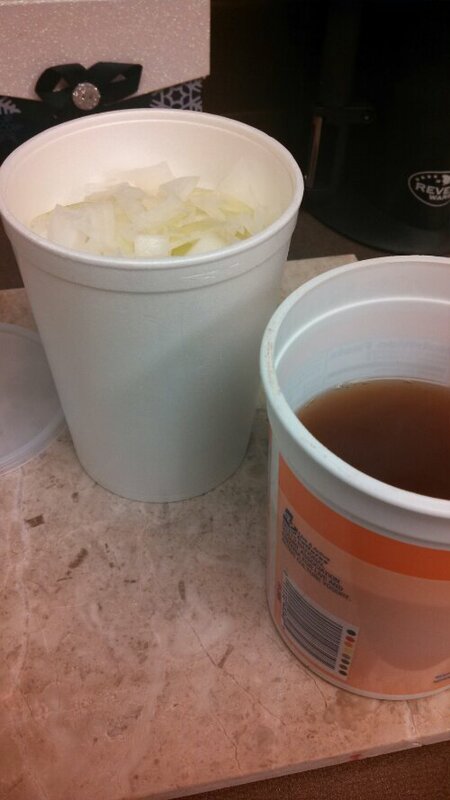 -Once or twice during the cooking process, try to check the liquid level and stir, adding more stock if necssary.